As Samuel Beckett himself might have done, let’s describe his world in spatial terms first: five books forming a rectangular cube, 6.5 inches wide by 9.25 inches high by 6.25 inches deep, each individual tome a deep blue graced by Laura Lindgren’s austere graphics. Within these bounds (a total volume of roughly 375 cubic inches) exists nearly all of the tramps, old women and small boys, bureaucrats and torture victims of Beckett’s landscape, conjured from a consciousness born astride the grave a century ago on Thursday 13. 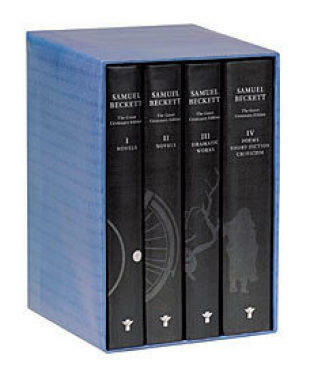 Edited by Paul Auster, the Grove Centenary Edition of Samuel Beckett from Grove Press is the first major American redaction of Beckett’s most important texts; these versions replace the ugly, typo-ridden editions issued by the same publisher in the 1950s to capitalize on the success of Waiting for Godot. Auster emphasizes in his introduction that the Grove books should not be viewed as the “complete works.” Any Beckett canon is provisional, since the author’s approval of the publication of juvenilia and early plays is hard to certify. The Dramatic Works volume, for example, omits Eleutheria, controversially published in 1995 after Beckett’s death. In the case of his plays, these new versions are especially welcome. Beckett continued to direct his early dramas later in his career, changing wordings and cutting passages as he perfected the texts, and only occasionally did these alterations make it to new editions. Some of his tweaks (presentable for respectable in Godot, for example) seem minor, but in texts as carefully crafted as Beckett’s, the reverberations of each word echo between and over their surrounding passages. The rest of the set contains two volumes of novels and one volume of poetry, essays and short stories: in all, over 2,000 pages of a psychic universe unique in 20th-century literature. It’s an invitation to begin hearing and seeing our own time through Beckett’s dark but glinting eyes. Available from Grove Press; $100.